Xilisoft iPhone Ringtone Maker helps you make iPhone ringtone by converting videos/audios to M4R ringtone for iPhone, and transfer the ringtone to iPhone directly after conversion if you want. And it fully supports iPhone 3GS (iPhone OS 3.0). New features: 1.Added the display of audio waveform for more precise adjustments of start point and end point. 2.Improved user experience in ringtone editing to make ringtones more handily. 3.Enriched ringtone management functions: Append ringtone files from PC to iPhone directly. Rename ringtones on iPhone. Export ringtones on iPhone to iTunes and PC. 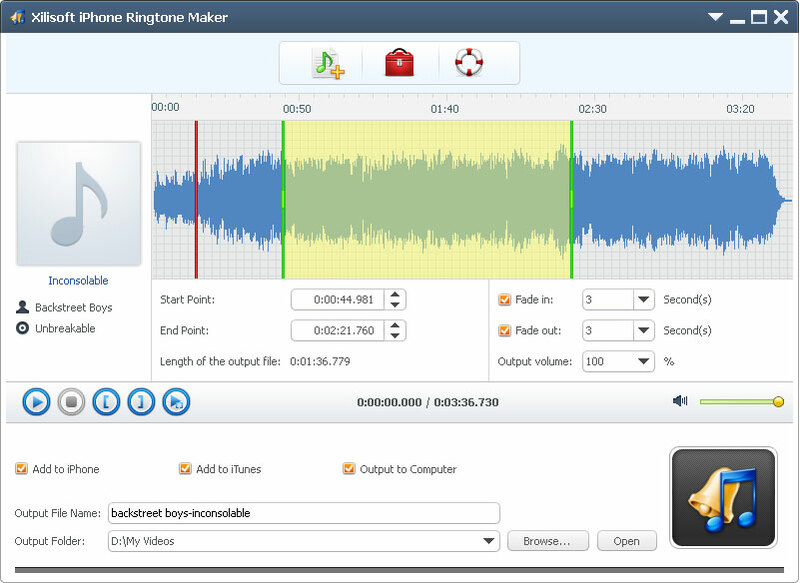 4.Added basic information of audio and video files, like cover, name, author and album name. Key features: 1.Support iPhone 3GS (iPhone OS 3.1).Now fully support iTunes 9.2.0.61 2.After making iPhone ringtone, this iPhone ringtone maker software can add the converted ringtone into your iPhone directly, thus you can hear the featured ringtone when your friends call you. 3.If you just love a clip in a music file, Xilisoft iPhone Ringtone Maker helps you set exact start time and end time of the segment and turn it into iPhone ringtone. 4.A built-in music player is available for you to preview source video/audio file before converting. 5.Making iPhone ringtone from your favored video/music file is so easy with this iPhone ringtone converter: add file and convert! 6.English, German, French, Spanish,Japanese,Italian and Chinese interface languages are provided in this iPhone ringtone creator for meeting different mother-tongue users. 7.Supports to add files by dragging and dropping 8.Makes ringtone more precisely with the time set to millisecond. 9.Supports fade-in and fade-out effect of ringtone. 10.Added the function of adjusting ringtone volume. 11.Supports to name the ringtone freely. Xilisoft Corporation focuses on the users' experience all along, offering the most easy-to-use software and consummate service. Added the display of audio waveform for more precise adjustments of start point and end point;improved user experience in ringtone editing to make ringtones more handily;enriched ringtone management functions;added basic information of audio and video files, like cover, name, author and album name.